Explanation: In 1997, Comet Hale-Bopp's intrinsic brightness exceeded any comet since 1811. Since it peaked on the other side of the Earth's orbit, however, the comet appeared only brighter than any comet in two decades. 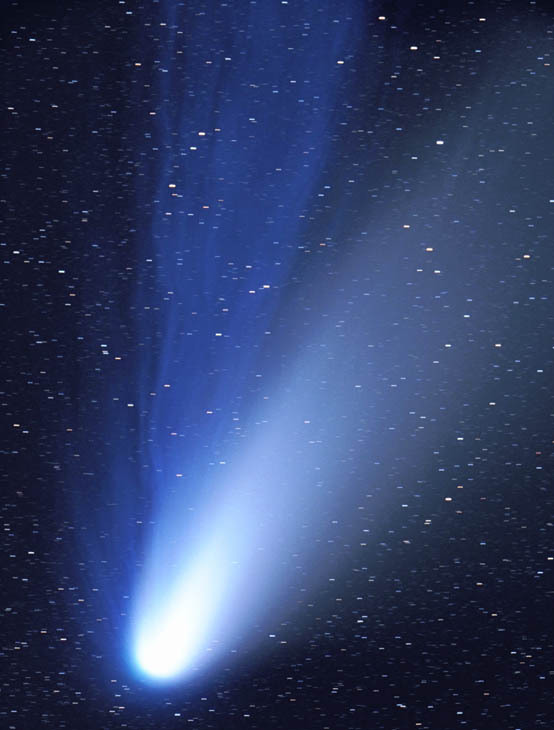 Visible above are the two tails shed by Comet Hale-Bopp. The blue ion tail is composed of ionized gas molecules, of which carbon monoxide particularly glows blue when reacquiring electrons. This tail is created by the particles from the fast solar wind interacting with gas from the comet's head. The blue ion tail points directly away from the Sun. The white dust tail is created by bits of grit that have come off the comet's nucleus and are being pushed away by the pressure of light from the Sun. This tail points nearly away from the Sun. The above photograph was taken in March 1997.